KLIK not only knows where a face appears on the screen, it knows who that face belongs to. I never forget a face. Neither, apparently, does my iPhone. 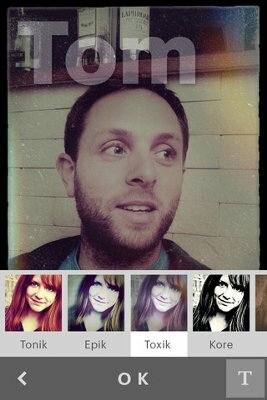 KLIK, the exciting new app from Face.com, can automatically recognize faces through the smart phone’s camera. Just open the app, take a photo, and KLIK will search through previous pics to correctly tag the face(s). If linked to a Facebook account KLIK becomes even more powerful, correctly identifying friends based on their shared photos. KLIK is so fast that, with a good internet connection, it can accurately identify someone before a picture is taken. Not only that, but it’s absolutely free! After downloading the app on an iPhone 3S and testing it for several days, this writer is amazed at how quick and accurate KLIK can be…when it works. There are definite bugs to be worked out of the system. Still, Face.com’s foray into mobile facial recognition for social media is stunning when it succeeds, and its launch hints at the absurd power this technology will have in the very near future. As Singularity Hub has discussed in the past, Face.com is a well known innovator when it comes to facial recognition. They are one of the leading sources (if not THE source) of facial recognition on Facebook, and their API allows for a wide range of applications. Automatic tagging of photos, locating faces for photo manipulation, even characterizing faces by their apparent emotions – Face.com can do it all, and it can do it very well. So well, in fact, that their technology has been used to help identify ‘anonymous’ looters from the most recent London riots. While Face.com technology isn’t fool proof when transforming blurry surveillance footage into quality court room evidence, it is remarkably powerful when dealing with the high quality pics taken by smart phones. Which is readily apparent with KLIK. The new social app is free and available for phones running iOS 4.3 and beyond. After downloading KLIK I hooked it up to my Facebook account and then pointed it at a friend. While I was still getting the photo lined up, KLIK superimposed my friend’s name on the screen. I hadn’t even taken the shot yet. It didn’t matter, KLIK had automatically searched through my data and found that friend’s face. It suddenly became clear why this app’s development codename was “Project Badass”. Automatic facial recognition and photo tagging on my iPhone for free? Both my friend and I were suitably impressed. The word “scary” was bounced around more than once. KLIK is aimed at making your photos social.. Even if KLIK isn’t quite ready for prime time, the underlying technology of this app is not to be ignored. Automatic facial recognition tagging was going to come to mobile sooner or later (and has in other guises) but KLIK shows that “sooner” means “today”. Not only that, but KLIK is just the most overt application for this branch of facial recognition. Face.com’s real strength seems to be in packaging their software into accessible, and widely used, APIs. 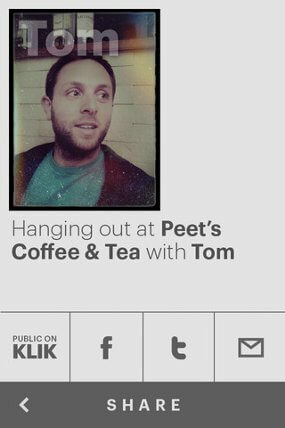 How long until something like KLIK is an integrated portion of every social media app? Facebook’s already using their tech on the back end, this mobile form of automatic tagging could clearly be a more overt feature offered very soon. Apple already has a similar sort of facial recognition embedded in their iPhone 4S (adapted from tech seemingly acquired from Polar Rose). The newest Android phones already let users unlock the devices with just their face as a pass code. It’s clear that smart phones can, with some nominal rate of failure, identify people quickly and effectively. That’s not years or even months in the future, that’s today. KLIK is fun, but I don’t really need it in my day to day life, and I don’t see the app itself as becoming a household name. Yet there’s no doubt that this technology is a game-changer. Automatic tagging in mobile phones through augmented reality interfaces – as awesome and futuristic as that sounds, it’s just the tip of the iceberg. Security applications for facial recognition have been widely discussed before, but again, this technology now seems like it could be universal in just months or years. The integration of facial ID with the social network is both amazing, and as my friend said “really, really creepy.” Is there a picture of you on the internet? Better assume it’s been automatically tagged with your name. Did someone point a smart phone at you in public? Same conclusion. While KLIK is limited to those photos shared by you and your friends on Facebook (or taken on your private camera roll) future versions of this tech are almost certainly going to be more widely applied. That means that in the next few years (maybe much sooner), any camera that sees you will know who you are. You are your face, and your face is public. If not today, then very, very soon. Welcome to the future. We got rid of the old sense of anonymity with a single click.